Exertion, calculation, courage achievement —rock climbing packs an exhilarating cocktail of mental and emotional states. Texas, known for its diverse landscape, serves that cocktail like places can. Make your way to new heights and a chance at gravity-defying glory in Texas. 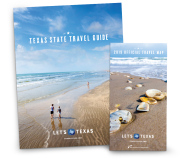 Whether you’re an avid climber or simply enjoy exploring unique rock formations, Texas is a mecca for outdoor enthusiasts. Lace-up your climbing shoes and clip-on your carabineers to explore some of the best rock climbing spots and most amazing views the state has to offer. Here are three spots to add to your rock climbing bucket list. Located in El Paso, Franklin Mountains State Park is another ideal West Texas rock climbing destination, and offers everything from sport climbs to bouldering. Visitors must bring all their own climbing equipment, and can climb at the designated area in McKelligon Canyon or at Sneed’s Cory in the Tom Mays Unit. The park headquarters are also located in McKelligon Canyon, while five camping areas with picnic facilities are in the Tom Mays Unit of the park. Peak climbing season at Franklin Mountains State Park is in the winter months of December and January, while late spring and early fall are also popular times. Located west of Austin in Dripping Springs, Reimer’s Ranch Park is home to rock climbing, mountain biking, hiking, fishing, horseback riding and swimming. The best times to climb are spring and fall, but it is possible to climb all year round, and even in the heat of summer there is plenty of shade along the cliffs. Most of the climbing area runs parallel to the beautiful Pedernales River, and visitors can cool off in the river during the hottest part of the day.